Amazon Kindle Touch 4th Generation WiFi 3G, 4GB 6" D01200, Text-to-Speech. Condition is Used. Shipped with USPS Priority Mail. see photos for condition. Battery holds charge, back shows some wear from case. Case shows much wear, Screen bright. Comes with case only. no charger. uses the ever so common micro USB to charge. Amazon Kindle Touch (4th Generation) 4GB, Wi-Fi, 6in - Silver. Condition is Used. Shipped with USPS Priority Mail. This was in the lost and found box from my old job. I assume it works, just needs a charge as the screen shows. Comes with a decent leather cover. Some scuffing on the case from cover rub it looks like. This auction is for the Kindle and cover ONLY. Sold as-is. No box, paperwork, cables, or charger. Amazon Kindle D01200. Kindle appears to be in working order the functions that we tested all worked. Kindle has a scratch on bottom front - SEE PICTURE. Cables and other accessories are not included unless explicitly stated/shown in pictures. Amazon Kindle Touch 4th Generation Model D01200 Wi-Fi With Free Case. Condition is like new. Shipped with USPS Priority Mail. Trending at $27.49eBay determines this price through a machine learned model of the product's sale prices within the last 90 days. Ecycling Done Right! Add To Favorites. Item Sold as is. If you're purchasing a device primarily for reading, an important consideration is the screen technology. E Ink screens look and read just like real paper. Kindle e-readers' matte screens reflect light like ordinary paper and use no backlighting, so you can read as easily in bright sunlight as in your living room. Amazon Kindle Basic 8th, WiFi, Black, eReader. Screen in poor condition (see photos). Affect performance of the Kindle. THIS KINDLE contains a 2 pixel ding on the screen (see above pictures #2 - #5.). Kindle Touch with Wifi. This is a previously owned Kindle "touch" which I have refurbished. Trending at $33.23eBay determines this price through a machine learned model of the product's sale prices within the last 90 days. Amazon Kindle Touch with WiFi - 6" D01200 - 2011. I believe I have taken back to factory settings. No scratches on screen. Shows signs of normal use and no wear on body. Plain and simple! Amazon Kindle Touch D01200, WiFi, Graphite, eReader. Screen in poor condition (many dead pixels). Amazon Kindle Touch. The reader has never been used. Includes a carrying case and charging cord (pictured). (1) Kindle Touch. (2) Case (Black). FREE CASE - KINDLE CASE SLIGHTLY USED. MINT CONDITION. Model D01200. Black & White touch screen. No scratches or marks. Always kept in leather case which is included with sale. Amazon Kindle Touch (4th Generation) 4GB, WiFi 3G, 6in, Gray - w/Ads. Screen in excellent condition- no dead pixels. EXCELLENT CONDITION - Very few marks on the unit. Amazon Kindle Touch 4th Generation WiFi 4GB 6" D01200, Text-to-Speech. Condition is Used. Shipped with USPS Priority Mail. There also could be e-ink minor marks left on the screen which will not effect the ability to read any passages. FREE NEW BELKIN CASE. We have cleaned all units front and back with a disinfectant (rubbing alcohol), we have also updated all software up to the current version as well as checked to make sure that the units are not blacklisted. Barely used. Like new condition. Works perfectly. No scratches. Includes case and cord. Minor scratches. Works great. Comes with a black cover with a sticker on it. Up for sale is a silver Amazon Kindle Touch 4th Generation D01200 that is in FAIR CONDITION! If you're purchasing a device primarily for reading, an important consideration is the screen technology. Unlike devices with LCD screens, Kindle e-readers use the latest generation of Electronic Ink ("E Ink") technology – E Ink Pearl – designed specifically to deliver clearer, sharper text that makes reading for extended periods of time more comfortable. Here are some of the advantages to reading on an E Ink device: Reads Like Real Paper, Even in Bright Sunlight E Ink screens look and read just like real paper. Kindle e-readers' matte screens reflect light like ordinary paper and use no backlighting, so you can read as easily in bright sunlight as in your living room. Unlike LCD screens, E Ink screens have no glare. Amazon Kindle Touch (4th Generation) 4GB, Wi-Fi, 6in - Silver. Content Formats Supported Kindle (AZW), Kindle Format 8 (AZW3), TXT, PDF, Audible (Audible Enhanced(AA,AAX)), MP3, unprotected MOBI, PRC natively; HTML, DOC, DOCX, JPEG, GIF, PNG, BMP through conversion. Good working condition. Screen has no scratches. See Photos. Amazon Kindle Touch (4th Generation) 4GB, WiFi 3G, 6in, Silver. Screen in excellent condition- no dead pixels. WITH CASE (light does not work). GOOD CONDITION - Very few marks on the unit. Amazon Kindle Touch (4th Generation) Wi-Fi. MINT condition. No scratches or dents whatsoever. Amazon Kindle Touch 4th Gen Model D01200 Wi-Fi 3G Black Leather Case. Condition is Used. Shipped with USPS First Class Package. Screen in great condition- no dead pixels. Amazon Kindle Touch (4th Generation) 4GB, Wi-Fi, 6in - Silver. Condition is Used but in phenomenal shape. No scratches or signs of damage anywhere, works good as new. Shipped with USPS Priority Mail. Model Number: D01200. Type: Amazon Kindle Touch. Notes: Amazon Kindle Touch 6, 4G B Ink Display 600 800 167 PPI Wifi Touch Screen. File Browsing, MP3 Player. Manufacturer: Amazon. All manufacturers' warranties are void unless otherwise stated. Amazon Kindle Touch 4th Generation Model D01200 Wi-Fi Pre Owned and tested. The screen still has the original plastic filmon it and all pixels are working. As with all 4th generation Kindles, this has a black and white screen only. 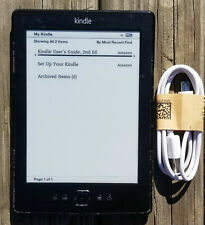 Amazon Kindle Touch (4th Generation) 4GB, Wi-Fi, 6in - Silver w/accessories. Includes CHARGER and CABLE and COVER and BOOKLIGHT (that charges off the kindle battery). Condition is Used. Shipped with USPS Priority Mail. Kindle is used and it has condition issues including scratches and a dark mark on the screen that is visible on one of the pictures but kindle works as intended. Please look at pictures for condition. High-contrast e-ink touchscreen reads like real paper with no glare. Easy-to-use touch interface. Lightweight at 7.5 ounces with a 6" screen. Holds 3,000 books (4 GB storage). Tap to turn pages, no need to swipe. Amazon Kindle Touch (4th Generation) 4GB, WiFi 3G, 6in, Silver. Model # D01200. Amazon Kindle Touch 4th Generation. Ready to sign into or create your Amazon account. Small mark on bottom left of screen, circled in last picture, scuffs to body. BETTER DEALS. Model: D01200. Make: Amazon. Check with the manufacturer for more warranty information.